1972 – a bit over 40 years ago. Seven years before we had reliable sea ice extent data from satellites and the year before the international agreement was signed by Arctic nations to protect polar bears from overhunting. In 1972, a bear biologist by the name of Jack Lentfer was working for the Alaska Department of Fish and Game, stationed at the Naval Arctic Research Lab in Barrow. Lentfer was one of the founding delegates of the Polar Bear Specialist Group, where he represented US interests until 1981. Warming and cooling, not just warming. He also had a paper published that year (Lentfer 1972b), entitled “Polar bear: Sea ice relationships.” Forty years on, I thought it was worth having a look at what Lentfer told his fellow polar bear biologist colleagues back then. There is a discussion of different ice types, currents and ice movements, with the figure below included. This is of interest in giving us an idea of the minimum and maximum extent that was usual in 1972. It’s also interesting in that the map aspect is from the Pacific (US) perspective, with the Bering Sea at the bottom, while modern NSIDC maps have the Atlantic on the bottom. So I’m including it spun around, so it can be viewed as we are used to seeing sea ice maps today. Figure 1. The top image appears to be the average sea ice extent maximum and minimum for the years around 1972, provided in Lentfer 1972. The bottom image is the same one, turned around to better compare with modern sea ice maps. A bit further on, there is an interesting discussion about changing climate and changing sea ice cover. Changes in ocean currents and climate affect sea ice. Vibe (1967)…distinguishes three different climatic periods, each about 50 years long, between 1810 and 1960, reflecting three stages of penetration of East Greenland ice into Davis Strait. He believes that conditions of 1810-1860 are now repeating themselves. 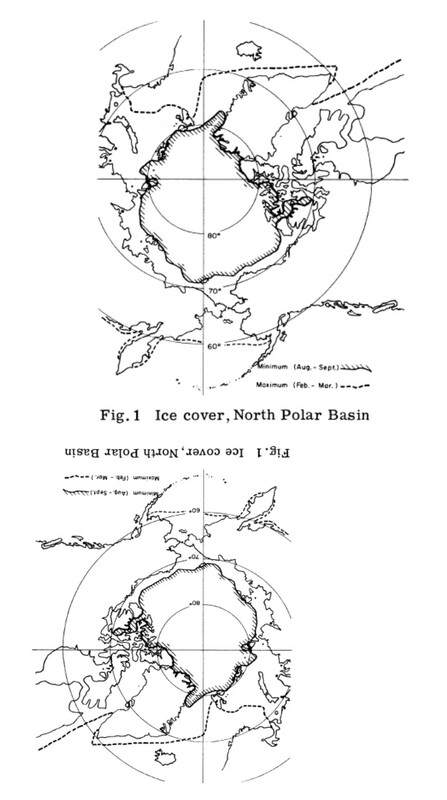 He designates this as a drift ice stagnation stage where…Greenland ice does not penetrate far north into Davis Strait. The climate is cold, dry, and stable. From both of these examples, it is clear that back in 1972, Jack Lentfer realized that both warming and cooling trends should be expected in the future because both occurred in the past – and he made it a point to inform his polar bear biologist colleagues of the historical basis of that conclusion. In 2012, Jack Lentfer (at the age of 80) was presented with a Lifetime Achievement Award by the Alaska Conservation Foundation. Lentfer, J.W. 1972b. Polar Bear: Sea Ice Relationships. Bears: Their Biology and Management 2: 165-171. This entry was posted in History, Sea ice habitat and tagged climate, cooling trends, Lentfer, PBSG, Polar Bear Specialist Group, population trend, sea ice extent, summer ice minimum, warming trends, winter ice maximum. Bookmark the permalink.